UPDATE (10:21PM) - I-75 is back open after it was closed for 13 hours for a hazardous material clean-up. Florida Highway Patrol says it started when troopers pulled over a box truck for a roadside inspection. During the stop, the troopers smelled a strange odor and discovered something leaking from the truck. Investigators say the truck was transporting 15,000 pounds of a resin solution, which is highly flammable. The containers of resin had to be inspected before being offloaded into another truck. The carrier transporting the material was Insituform Technologies out of Montana. They were fined $500 for violation of hazmat general regulations, and the truck will be out of service until the situation is rectified. UPDATE (1:30PM) -- Florida Highway Patrol reports that all southbound lanes have reopened beginning at the Tucker's Grade exit (#158). All northbound lanes are still closed at Bayshore Road (#143) in North Fort Myers due to the HAZMAT investigation at mile marker 153. Monday morning at approximately 9am, HAZMAT crews were called to the scene when fumes were reportedly coming from a box truck that was pulled over. The interstate was shut down and crews began working to contain the hazardous material in the truck, which county officials have confirmed to be 1,300 gallons of styrene in the refrigerated truck. Styrene is a flammable, toxic chemical. Northbound drivers should take Bayshore Road to U.S. 41 north, and can re-enter I-75 northbound at Tuckers Grade. 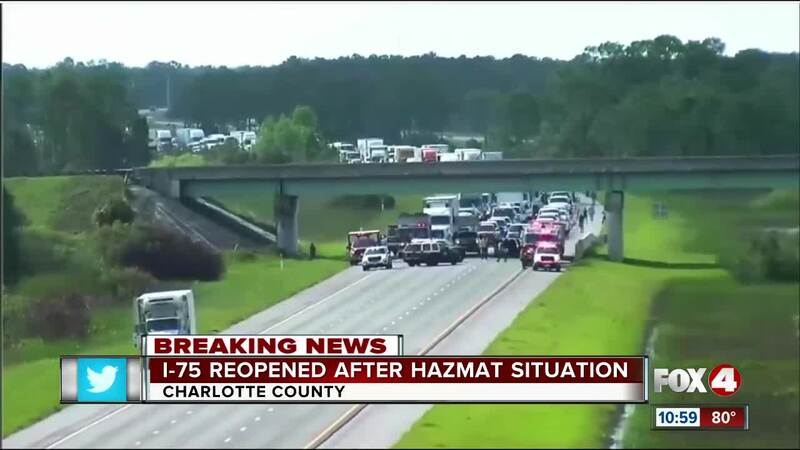 CHARLOTTE COUNTY, Fla. -- Authorities have completely closed a section of Interstate 75 Monday morning due to a HAZMAT investigation. It's happening near mile marker 153 in Charlotte County, between the Bayshore Road exit in North Fort Myers and the Tucker's Grade exit in Punta Gorda. This is near the Oil Well Road overpass. All northbound and southbound lanes are blocked during the investigation. Traffic is being routed off at Tucker's Grade (#158) and Bayshore Road (#143), according to Florida Highway Patrol. Live traffic conditions can be viewed HERE . All lanes of I75 are closed in Charlotte Co..NB 143 mm and SB at 158 mm due to a hazmat incident on NB I75 at mm 153.